Bircher Muesli oat mix with fruits and seeds. Making oats more awesome. Overnight oats. No added sugar - contains naturally occurring sugars. High in fibre. Gluten free. Suitable for vegetarians and vegans. Did you know? Overnight Oats is another name for Bircher Muesli. A single serving (50g) of our Bircher Muesli mix provides 1.5g of Beta Glucan from oats, which is 50% of 3g, the suggested daily intake. 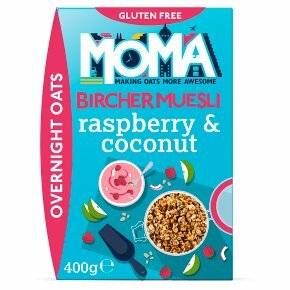 How to make your Bircher Muesli You will need: 50g MOMA Bircher Muesli + 50g Natural Yoghurt +70ml Apple Juice 1 Add your MOMA Bircher Muesli to a bowl, along with yoghurt (or dairy free alternative) and apple juice. 2 Give it a good stir and leave to soak for 5 minutes. 3 You're done, just sit and enjoy! 3 Ways to make your Bircher Muesli 1 Minute? Just add milk or a dairy free alternative. 5 Minutes? Follow our classic Bircher Muesli recipe on the back of the pack. 10 Minutes? Go wild, follow the classic recipe and top with your favourite chopped up fruits and grated apple.